We offer a variety of services including training, lessons, day camps, clinics, pony parties, and trails. We offer instruction in eventing, dressage and hunter jumper disciplines. Peaceful boarding and training facility. Management lives onsite. Pastures, paddocks, stalls, covered and outdoor arena, trails around property. Sale horses. Pony lesson program. Best rates in area! Cevalo Riding Academy - Got Jump? Cevalo offers year-round riding lessons for both children and adults. Whether you're a beginner or have been riding for years, our experienced instructors and talented school horses will help you build confidence, advance your riding, and and have fun. Jump in and join us! 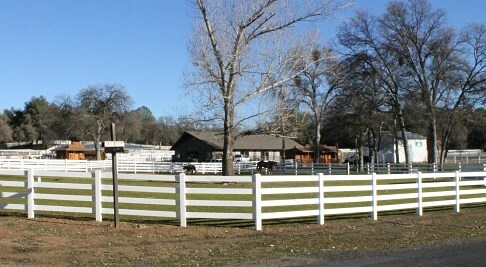 Full care facility offering boarding, training, lessons, sales, breeding, camps, and Pony Club. Stalls, individual pastures, and group pastures w/shelters. Covered arena, sand jump arena, round pen and cross country course. Special pastures for retirees and mares/foals. In business since 1989. We offer equine services in northwestern California. Harris Equines operates on a foundation of understanding equines and developing functional, comfortable and safe relationship. We offer training and retraining, lessons on our gentle, beautiful horses, and pony parties/rides for teeny tots. Through horsemanship, kids learn responsibility, compassion, teamwork, leadership and respect. Adults re-connect or discover youthful joy in handling lovely, well-trained Equine Citizens. Parties based at our farm include; baby farm animals, pony rides, games, crafts, pictures, t-shirts, BBQ grill, tables with umbrellas for guests, and much more!!!! !